This article is about the baseball player and manager. For the Scottish footballer, see Bobby Cox (footballer). For other people named Robert Cox, see Robert Cox (disambiguation). Robert Joseph "Bobby" Cox (born May 21, 1941) is an American former professional baseball third baseman and manager in Major League Baseball (MLB). 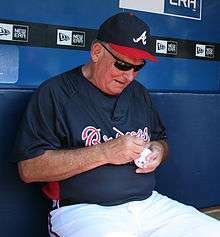 He first led the Atlanta Braves from 1978 to 1981, and then managed the Toronto Blue Jays from 1982 to 1985. He later rejoined the Braves in 1985 as a general manager. He moved back to the manager's role during the 1990 season and stayed there until his retirement following the 2010 season. The Atlanta Braves have since retired the number 6 in commemoration of Bobby Cox. He led the Atlanta Braves to the World Series championship in 1995. He holds the all-time record for ejections in Major League Baseball with 158 (plus an additional three post-season ejections), a record previously held by John McGraw. Cox ranks fourth on the baseball all-time managerial wins list. As a player, Cox originally signed with the Los Angeles Dodgers, but was never able to make the Dodgers' major league team. Eventually he was acquired by the Braves, but never appeared in an MLB game for them either. Instead, he was traded to the New York Yankees on December 7, 1967. Cox played two seasons, mostly at third base, for the Yankees. Because of bad knees, Cox became the second in a string of four stopgap players between Clete Boyer and Graig Nettles. Prior to managing in the States, Cox played from 1967 to 1970 for the Cardenales de Lara and Leones del Caracas clubs of the Venezuelan Winter League. He later managed the Cardenales during three consecutive seasons from 1974–75 through 1976–77. In between, he coached and managed in the Yankees minor league system. Cox began his managerial career in the Yankees farm system in 1971. In 1976, he led the Syracuse Chiefs to the Governors' Cup title. This team featured such future major leaguers as Ron Guidry, Mickey Klutts, Terry Whitfield and Juan Bernhardt. Overall, Cox had a highly successful six-year tenure as a minor league manager, compiling a record of 459 wins and 387 defeats (.543) with two league championships. He then spent the 1977 season as the first base coach on Billy Martin's staff with the World Series–winning Yankees before beginning his MLB managerial career. Cox replaced Dave Bristol as the manager of the Atlanta Braves prior to the 1978 season, inheriting a team that had finished last in the league during the previous two seasons and, in 1977, compiled a worse record than the first-year Seattle Mariners of the American League. Building from the ground up, the Braves finished last in both 1978 and 1979. Entering 1980, Cox made one of the unusual moves for which he is known, moving power-hitting first baseman–catcher Dale Murphy, who had developed a throwing block as a catcher that hindered his ability to play, to center field. Murphy later won two National League Most Valuable Player Awards and five Gold Gloves, and became one of the premier players of the 1980s. In 1980, the Braves finished fourth with their first record above .500 since 1974. However, Cox was undone by the 1981 baseball strike when the Braves finished fifth and owner Ted Turner fired him. Asked at a press conference who was on his short list for manager, Turner replied, "It would be Bobby Cox if I hadn't just fired him. We need someone like him around here." The Braves won the National League West division title in 1982 and finished second in both 1983 and 1984 under Cox's successor Joe Torre. Cox finished with a record of 266 wins and 323 losses in the regular season. Cox joined the Toronto Blue Jays in 1982, who steadily improved over the four years of his management. In 1985, Cox's fourth season with the club, the Blue Jays finished in first place in the American League East. That season, the American League Championship Series was expanded to a best-of-seven format after sixteen seasons of a best-of-five format. This change ultimately made the difference when Cox's Blue Jays became only the fifth team to lose a playoff series after leading 3 games to 1 to the Kansas City Royals. He finished his stint as manager with a record of 355 wins and 292 losses regular season record. After the Blue Jays' elimination, Cox returned to the Braves as general manager. After going through two managers over the course of less than five years with disastrous results in attendance and outlook, Cox fired Russ Nixon in June 1990, and appointed himself as the manager. Cox had spent the prior four seasons accumulating talented players, including Tom Glavine, Steve Avery, Pete Smith, and David Justice. He was also responsible for drafting Chipper Jones with the first overall pick in the 1990 draft. In 1991, the Braves, along with the Minnesota Twins, became the first teams to go from last place to first place from one year to the next. The two teams met in the 1991 World Series, which the Twins won in seven games. It was the second World Series in which the home team won every game. The first was in 1987 when the Twins defeated the St. Louis Cardinals in seven games. In 1992, Cox's Braves held a 3–1 lead in the National League Championship Series against the Pittsburgh Pirates before losing games 5 and 6, although they did win Game 7 on Francisco Cabrera's ninth-inning, two-out, pinch-hit, two-run single. They went on to lose the World Series to the Toronto Blue Jays. In 1993, the Braves had the best record in baseball after a pennant race where they overcame a ten-game deficit in August to beat the San Francisco Giants. By going 51–17 over the last two and a half months of the season, they won the division by a game. However, they lost the National League Championship Series in six games to the Philadelphia Phillies. In 1995, the Atlanta Braves won Cox's only World Series championship, over the Cleveland Indians. Their division title in 1995 marked the first time since 1989 that neither the Philadelphia Phillies nor the Pittsburgh Pirates won the National League East. In May 1995, Cox was arrested on simple battery charge after his wife called 911 and said Cox hit her. She retracted the statement the following day, and the charges were dropped after the couple attended court-ordered counseling. In 1996, the Braves again won the division title. After sweeping the Los Angeles Dodgers in the division series, the Braves' pitching fell behind the St. Louis Cardinals, three games to one in the 1996. Facing elimination, the Braves offense outscored the Cardinals 33–1 over the final three games and won the pennant. Cox became the only manager in history to lose a series leading three games to one and win a series trailing three games to one. The scoring continued into the first two games against the New York Yankees as the Braves took a two games to none lead by winning with scores of 12–1 and 4–0 in the World Series. In game four, the Braves led 6–0 in the fourth inning, but the Yankees came from behind. Jim Leyritz homered to tie the game, and the Yankees tied the series with a win in 11 innings, 8–6. The Yankees would ultimately win in 6 games. The Braves lost to the Florida Marlins in the 1997 NLCS and the San Diego Padres in the 1998 NLCS. The Braves made it back to the World Series in 1999, but lost to the defending World Series Champion New York Yankees in four straight games. Cox's 2001 team won the division title and upset the favored Houston Astros in three straight games in the division series. However, the Arizona Diamondbacks defeated the Braves in five games in the NLCS. One of Cox's memorable games as manager of the Braves during this period came on September 21, 2001, when they played rival New York Mets in the first major professional sporting event played in New York City since the 9/11 attacks. Cox's Braves did not advance past the first round of the playoffs in any of their last five appearances. In 2002, the Braves won 101 games and led the wild card San Francisco Giants two games to one before dropping the last two. In 2003, the Braves pushed the Chicago Cubs to the fifth game before falling. The following year, the Braves lost in the best-of-five Division Series for the third straight year. In 2005, the Braves lost to the Houston Astros, with the finale taking eighteen innings to decide in the 2005 NLDS. On September 23, 2009, Cox signed a one-year contract extension through 2010, and on the same day announced that 2010 would be his final year as manager. He also announced that he agreed to stay on as an advisor for team baseball operations for the next five years after he retires. On October 2, 2010, the Atlanta Braves honored Bobby Cox at Turner Field in a sold-out game. On October 3, 2010, Cox led the Braves to an 8–7 win over the Phillies and clinched both his and the Braves' first wild card. His final game was on October 11, 2010, when the Braves were eliminated by the San Francisco Giants in Game 4 of the National League Division Series. He was given a standing ovation by the crowd and both teams immediately following the game. He finished with a record of 1,883 wins and 1,386 losses in the regular season and 64 wins and 65 losses in the post-season. His record from both stints as manager is 2,149 wins and 1,709 losses for a .557 winning percentage in 3,858 games. His overall managerial record is 2,504 wins and 2,001 losses in the regular season and 67 wins and 69 losses in the post-season. Bobby Cox's number 6 was retired by the Atlanta Braves in 2011. Cox has been named Manager of the Year four times (1985, 1991, 2004, 2005) and is one of only four managers to have won the award in both the American and National League. He is also the only person to have won the award in consecutive years. Cox has also been named Manager of the Year by The Sporting News eight times (1985, 1991, 1993, 1999, 2002, 2003, 2004, and 2005). On May 12, 2007, Cox passed Sparky Anderson to become the fourth-winningest manager in major league history, with a record of 2,195 wins and 1,698 losses. He led the Braves to a division title every season from 1991 to 2005, excluding the strike-shortened 1994 season; the Braves have competed in the National League East since 1994 and competed in the National League West prior to that. He won a World Series Championship in 1995. In 2001, he took sole possession of first place for most wins as a manager in Braves history. Cox's .561 winning percentage is fourteenth in all-time among managers with at least 1,000 games managed, and is the second highest among those who managed the majority of their career after the creation of divisions within each league in 1969. On June 8, 2009, Cox won his 2,000th game with the Atlanta Braves, becoming only the fourth manager in Major League history to accomplish that feat with one team. Cox reached career win number 2,500 on September 25, 2010, becoming only the fourth manager in Major League history to do so. Cox is also the only person among all players and managers to be ejected from two World Series games (1992 and 1996). He was ejected in the ninth inning of game three of the 1992 World Series for throwing a batting helmet onto the field at the SkyDome. Cox was trying to slam the helmet against the lip of the dugout and missed, throwing it onto the field. Cox was tossed again in the final game of the 1996 World Series after protesting an out call of Marquis Grissom attempting to take second base on a passed ball. Although video replays appeared to show Grissom as safe, umpire Terry Tata called him out, and Cox was tossed in an ensuing argument. On August 12, 2011 a luncheon was held by the Braves, and Cox was inducted into the Atlanta Braves Hall of Fame and his number six jersey was retired. 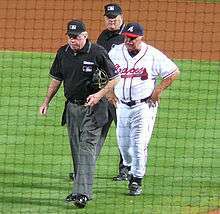 Afterward, an on-field ceremony was held that recognized the long-time Braves manager prior to the scheduled game versus the Chicago Cubs. Cox was unanimously elected to the Baseball Hall of Fame by the 16-member Veterans Committee on December 9, 2013. The ceremony was held on July 27, 2014. Cox was hired on September 22, 2014 to return on a part-time basis to help the Atlanta Braves choose their next General Manager and Director of Player Development after the dismissal of General Manager Frank Wren and Player Personnel Director Bruce Manno. ↑ August 11, 2011. Macconnell, Mike "Atlanta Braves to Retire Bobby Cox's No. 6: Looking Back at his Career". ↑ Ulman, Howard (June 21, 2009). "Green's homer gives Boston 6–5 win over Atlanta". Yahoo! Sports. Associated Press. ↑ "Dale Murphy". Baseball-Reference.com. Retrieved 2007-04-05. 1 2 3 4 5 6 "Bobby Cox". Baseball Reference. Retrieved February 13, 2014. ↑ "Chipper Jones". Baseball-Reference.com. Archived from the original on February 10, 2009. Retrieved 2007-04-05. ↑ "World Series History: Recaps and Results". MLB Advanced Media, L.P. Retrieved 2007-04-06. ↑ "Cox gets one-year extension". ESPN. Associated Press. September 24, 2009. ↑ "Atlanta Braves Managers". Baseball Almanac. Retrieved 2007-04-05. ↑ O'Brien, David (June 9, 2009). "Cox honored for 2,000th win". Atlanta Journal-Constitution. ↑ Rogers, Carroll (September 25, 2010). "Cox reaches 2,500 wins for career". Atlanta Journal-Constitution. ↑ "Baseball Managers". Baseball Almanac. Retrieved 2007-04-05. 1 2 Lake, Thomas (July 26, 2010). "Thumbing his Way back home". Sports Illustrated. Time Inc.: 49. 1 2 "World Series Ejections". Baseball Almanac. Retrieved 2007-04-05. ↑ "Braves to retire Cox's No. 6, add him to Hall". Atlanta Braves. MLB. March 22, 2011. ↑ "Cox humbled by entrance into Braves' Hall". Atlanta Braves. MLB. August 12, 2011. ↑ "La Russa, Torre, Cox unanimously elected to Hall". St. Louis Post-Dispatch. December 9, 2013. Wikimedia Commons has media related to Bobby Cox.